Mortgage markets improved last week as the Federal Reserve introduced new economic stimulus. The move trumped bond-harming action from the Eurozone, and a series better-than-expected U.S. economic data. The 30-year fixed rate mortgage rate dropped last week for most loan types, including for conforming, FHA and VA loans. 15-year fixed rate mortgage rates improved, as well. Mortgage rates are back near their lowest levels of all-time. Last week’s main event was the Federal Open Market Committee’s sixth scheduled meeting of 2012. Wall Street expected the Fed to launch a third round of quantitative easing (QE3) after its meeting and the nation’s central banker did not disappoint. It launched QE3 and did so with such scale that even Wall Street was shocked. The Federal Reserve announced a plan to purchase $40 billion monthly of mortgage-backed bonds indefinitely, a move aimed at lowering U.S. mortgage rates in order to stimulate the housing market which can create more jobs in construction and other related industries. The Fed will continue to buy mortgage bonds until it deems such purchases no longer necessary. 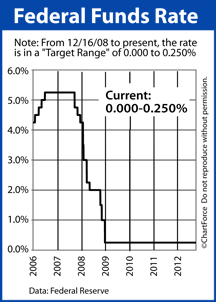 The Fed also announced a commitment to holding the Fed Funds Rate in its current target range of 0.000-0.250% until mid-2015, at least. Mortgage rates responded favorably to the stimulus, falling to their lowest levels of the week. It masked a rise in rates from earlier in the week tied to the German court’s clearing of the European Stability Mechanism — the Eurozone “bailout fund”. The action clears the way for debt-burdened nations including Spain and Greece to get the support necessary to remain solvent. Mortgage rates were also pressured higher by a strong consumer confidence report. When consumers are more confident in the economy, they may be more likely to spend and consumer spending accounts for more than two-thirds of the U.S. economy. This week, mortgage rates throughout TN face competing pressures. The Fed’s bond-buy has started and that will lead rates lower, but with Housing Starts and Existing Home Sales data set for release, data could pull rates up.